Home Breads BUNS, BEAUTIFUL BUNS! I’ve added another bread to my repertoire! I hope you will love these buns as much as we do. They are perfect for burgers and sandwiches or they can be toasted, buttered, and spread with sugar-free jam. They are low-carb, gluten-free, grain-free, and flax-free. Preheat oven to 400 degrees F. Grease a 9-inch round or square baking pan and line with parchment paper, Grease the paper also. If using instant yeast, add to dry ingredients. If using active dry yeast, dissolve in 1 tablespoon warm water and stir into wet ingredients. Yeast is for flavor only and will not affect rise. Break eggs into a second bowl and whisk until smooth. Whisk in sour cream or yogurt, oil or melted coconut oil or butter, and vinegar. With a greased knife or rubber spatula, cut the dough into 4 pieces for buns, 8 for dinner rolls. With the spatula and greased fingers, shape pieces into balls and put in prepared baking pan. Sprinkle buns with a few extra seeds or nuts if desired. Bake on middle rack in oven for 20 to 25 minutes or until nicely browned. Split buns with a serrated knife and toast for best flavor and texture. 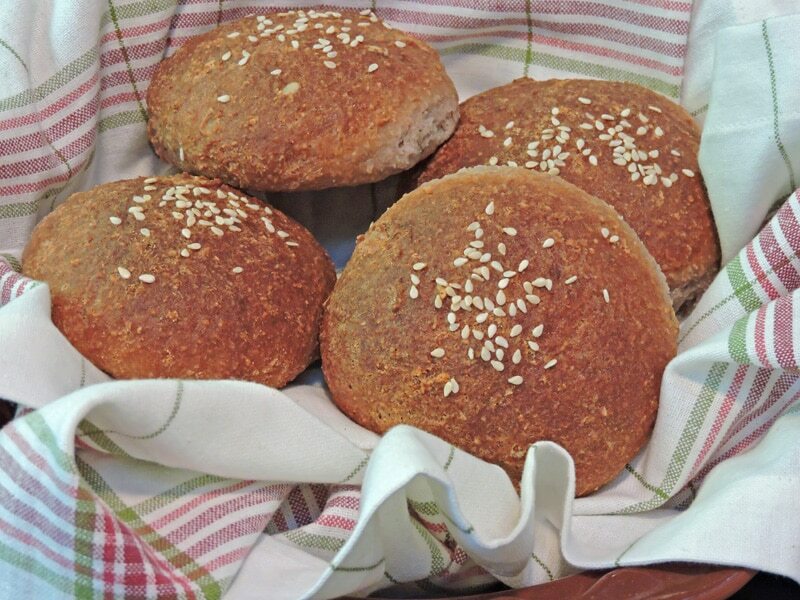 Serve with butter and sugar-free jam or use as buns for burgers, sandwiches, or eggs Benedict. Storage: To keep baked goods made with nuts and seeds fresh longer, store them in an airtight container lined with a paper towel and place in refrigerator or freeze. The towel will absorb excess oil and moisture. Separate buns with parchment paper when freezing for easy removal. Recipe inspired by Theresa Fletcher at thelowcarbreview.blogspot.com. Makes 4 buns or 8 dinner rolls. If using yogurt, some of the carbs will have been eaten by the live cultures. The amount that remains is about 2 grams per 1/2 cup of yogurt, so similar to the counts above for using sour cream..
*Optional add-ins could include: pine nuts, sesame seeds, poppy seeds, fennel seeds, caraway seeds, currants, or a mixture. Add ins are for flavor and crunch only and do not affect rise. I used Frontier brand psyllium husk powder. Some brands may be gritty. These buns contain 1 and 1/2 teaspoons of fiber for each of 4. If you are not adapted to getting much fiber, start with just one or 1/2 bun per day. If dough is sticky and hard to shape, let it sit a little longer. You can also dust it with a little coconut flour or spray it lightly with cooking spray. For dairy-free buns, use coconut yogurt and olive oil or melted coconut oil. Thanks for the comment, Anonymous. Hope you like them! jewel3ca: I like the Yogurt biscuits with some things, but I love the buns for sandwiches. They are bigger and more like yeast bread than biscuits. I also have recipes for wraps and flatbreads and crackers, so just about have it covered now! Thanks for the comment. Hemp makes me sneeze! Are the hemp seeds just for fun or important to the end result? Any chopped nuts or seeds should work. I listed several options in the recipe.